Trademark notice: Bubbleboddy ExtraLight is a trademark of studio kmzero. Description: Copyright (c) 2009 by studio kmzero. All rights reserved. 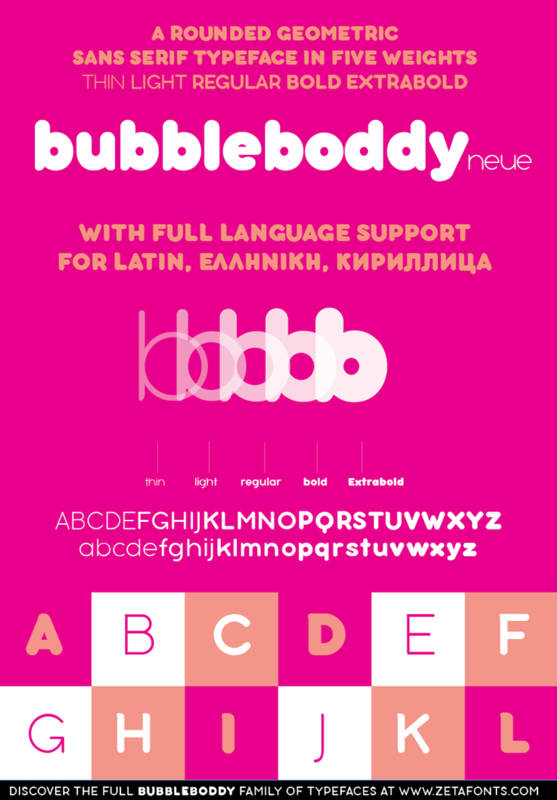 Bubbleboddy is the first version of Bubbleboddy Neue Family. If you like this font, try Bubbleboddy Neue: it has been completely redesigned preserving the original round and chunky flavor and adding three new weights and a complete cyrllic and greek character set to infuse your design with an original 80s touch and all the juicy sweetness of a bubblegum. Born for logos and display use, the family has now got a complete facelift with better readability onscreen for web use and offline for text setting.